Lesson 6: Jesus is Alive Today! When Jesus, the Son of God, died on the cross and was buried, Satan and his fallen angels thought they had won a great victory. They were very mistaken! On the third day, Jesus rose from the dead. Jesus is alive today! Did Jesus really rise from the dead? Yes, He certainly did! The Lord Jesus is alive today! Where is He? 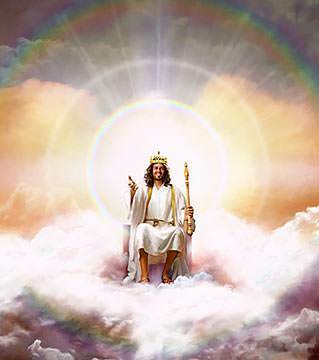 The Lord Jesus is in Heaven right now, seated at the right hand of God the Father. Let us see exactly what happened. 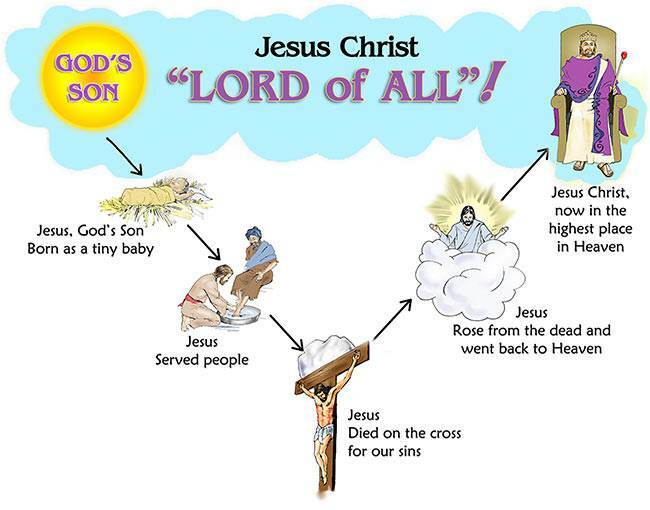 The Lord Jesus died on the cross about three o’clock in the afternoon. He was buried in a new tomb, carved out of rock. On the third day after He was buried, Jesus rose from the grave as the mighty Victor over Satan, sin and death. Christ’s resurrection proves that He is the Son of God, and that all He said is true. The Bible says that Jesus Christ is "shown to be the Son of God with power…by the resurrection from the dead" (Romans 1:4). Satan thought that he had won a mighty victory when he succeeded in getting wicked men to put God’s Son to death. But he was never more mistaken! We may be sure that Satan and all the rulers of darkness used every power they had to keep Christ in the tomb. But on the third day, Christ rose from the grave, victorious over Satan and all the powers of darkness! 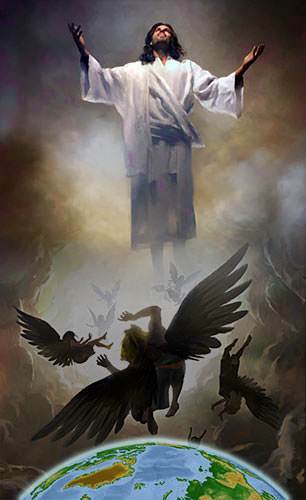 When Christ returned to Heaven, He went as the mighty Victor over Satan and all the powers of darkness. He showed that He had defeated all His enemies. 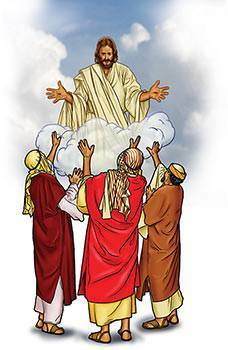 When the Lord Jesus returned to Heaven, the Father welcomed Him, and gave Him the place of highest honor in Heaven. Where is this place of highest honor? It is at the Father’s right hand. Before He went to the cross, Jesus had prayed to His Father, saying, "I have glorified You on the earth: I have finished the work which You gave Me to do. And now, O Father, glorify Me… with the glory which I had with You before the world was" (John 17:4-5). The Father has answered that prayer in the most wonderful way. He has glorified His Son by giving Him the highest place in Heaven. The Man, Jesus Christ, is now seated at the right hand of the Father. The Bible says, "…He [God] raised Him from the dead, and set Him at His own right hand in the heavenly places" (Ephesians 1:20). Dear friend, study this picture carefully. It tells the wonderful story of how God’s Son left His home in Heaven and came down to this world to be born as a tiny baby. When Jesus grew up, He humbled Himself to serve people. He even washed the feet of His disciples. Finally, He "…humbled Himself, and became obedient unto death, even the death of the cross" (Philippians 2:8). Why did He do it? He did it because it was His Father’s will and because He loved us so much. Jesus went down, down, down to die on the cross for us. He was buried, but God raised Him up from the dead. Up, up, up Jesus went, back into Heaven. There God gave Him the place of highest honor in Heaven. The Bible says, "God also has highly exalted Him, and given Him a name which is above every name: That at the name of Jesus every knee should bow, of things in heaven, and things in earth…And that every tongue should confess that Jesus Christ is Lord, to the glory of God the Father" (Philippians 2:9-11). 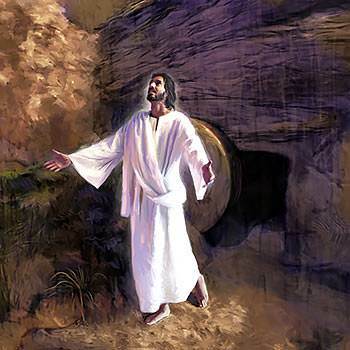 Jesus appeared on the earth for forty days after He rose from the dead. He appeared to His disciples many times. He was seen by many people. On one occasion, over 500 people saw Him. Then one day Jesus told His disciples that He would soon be going back to Heaven. He said to them, "All power is given unto Me in heaven and in earth" (Matthew 28:18). 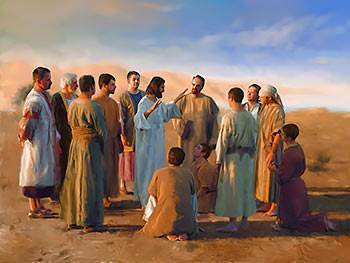 Jesus told His disciples to go into all the world and tell the good news about Him to every person. Then Jesus blessed His disciples. As they watched Him, He went up, up, up into the sky. The disciples watched Him until a cloud hid Him from their sight. While they were looking up, two men in shining white clothes appeared and said to them, "…This same Jesus, which is taken up from you into heaven, shall so come in the same way as you have seen Him go into heaven" (Acts 1:11). The Lord Jesus is in Heaven today. He is seated at the right hand of God the Father. He has all power in Heaven and on earth. One day He is coming back to the earth. We know that Jesus is coming back because the two men said, "This same Jesus…shall so come in the same way as you have seen Him go into heaven." 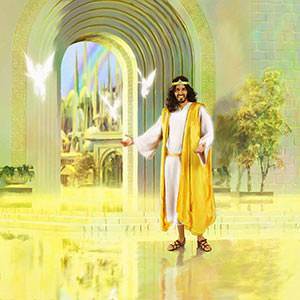 Jesus is coming back to take all those who believe on Him to be with Him. He said that He was going to prepare beautiful homes in Heaven for His believers. Jesus said, "…I go to prepare a place for you. And if I go and prepare a place for you, I will come again, and receive you unto Myself; that where I am, there you may be also" ( John 14:2-3). The most important question for us is: What must I do to be saved? 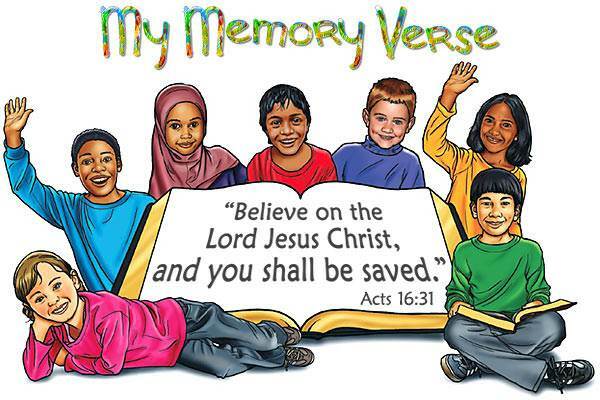 The Bible says, "Believe on the Lord Jesus Christ, and you shall be saved" (Acts 16:31). 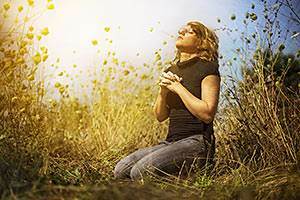 What does it mean to "Believe on the Lord Jesus Christ?" First, let us see the meaning of His name. "LORD" This is His kingly name. It stands for His rulership over all things. He has all power in Heaven and in the earth. "JESUS" This is His personal name. It means "Savior." Jesus is the Savior—the One who died on the cross for our sins and rose to become our living Savior. "CHRIST" This is His official name. It means "the Anointed One." He is the One chosen and sent by God to be the Savior of the world. To believe on the Lord Jesus Christ means to believe that He is the Son of God, and that He died for your sins, and rose again to be your Savior and Lord. 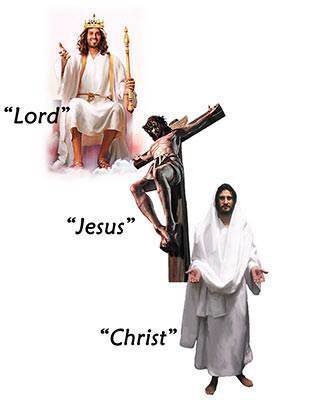 It means that you have taken Him as your Savior. If you are not sure that you have done this, talk to the Lord Jesus and tell Him that you do believe on Him and that you are taking Him as your Savior. Click on the Questions link below to do the questions.